Full Color Table Throws with Dye-Sub Custom Print. Please note: 30" DEPTH TABLE-THROW is only available in 4ft. Stretch style. Available in full graphic prints. The Open Back version has full length front and side material, with a shorter edge on the backside, this option is convenient for under table storage. The Full Back version has full length material on the front, back and both sides of the table. Graphic finishing is Dye - Sublimation Printing on fabric material with sewn edges. 4 ft. STANDARD TABLE-THROW: made for 4 ft. tables. Options: 4-sided & 3-Sided. 8 ft. STANDARD TABLE-THROW: made fir 8 ft. tables. Options: 4-sided & 3-Sided. 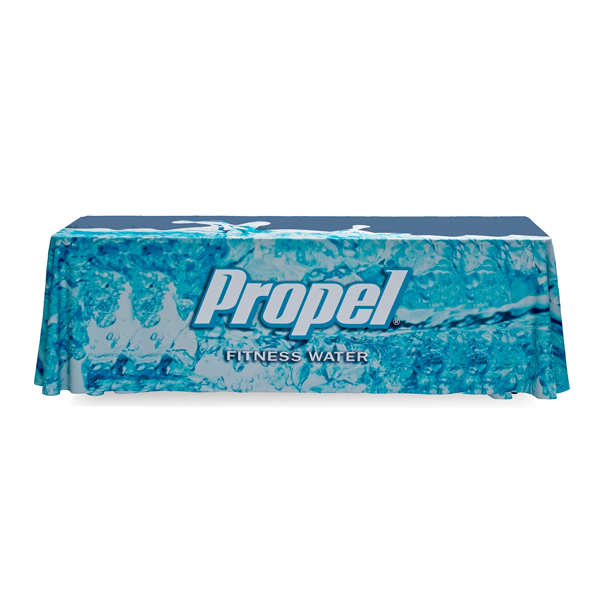 Get your graphic edge-to-edge custom printed on fitted table throw. The 4-sided option fully covers the front, back and sides of the table. The 3-Sided option is convenient for under table storage. Fitted Table Throws fit snug around the table. Graphic finishing is Dye - Sublimation Printing on fabric material with sewn edges. 4 ft. FITTED TABLE-THROW: made to fit 4 ft. tables. Options: 4-sided & 3-Sided. 8 ft. FITTED TABLE-THROW: made to fit 8 ft. tables. Options: 4-sided & 3-Sided. Get your graphic custom printed on stretch table throw. Stretch table-throws fit tapered and taut around the table and secures under its legs. The 4-sided option fully covers the front, back and sides of the table. 3-Sided option is convenient for under table storage. Graphic finishing is Dye - Sublimation Printing on fabric material with sewn edges. 4 ft. STRETCH 30" DEPTH TABLE-THROW: Comes in 3-Sided & 4-Sided. 4 ft. STRETCH TABLE-THROW: Comes in 4-Sided. 6 ft. STRETCH TABLE-THROW: Comes in 3-Sided. 8 ft. STRETCH TABLE-THROW: Comes in 4-Sided.